I have been very fortunate this past year. I have commented on various blogs and ended up a winner at several giveaways in the past couple of months. I won an electronic copy of "Wee Folk" by Salley Mavor. 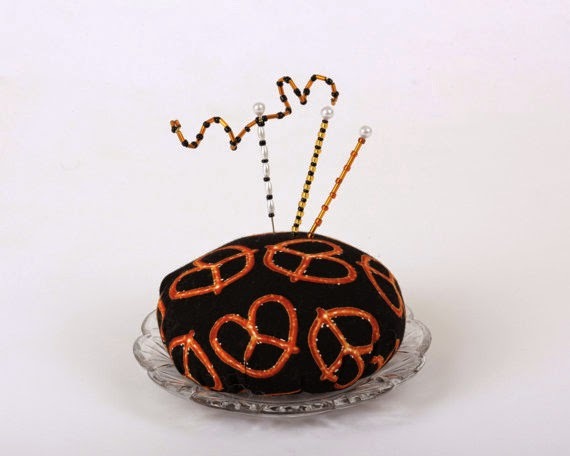 A pretzel pincushion and some great looking pins from Karen of Selvage Blog. A seam ripper, an orphan block and some lovely layer cake fabrics from Deonn of Quiltscapes. 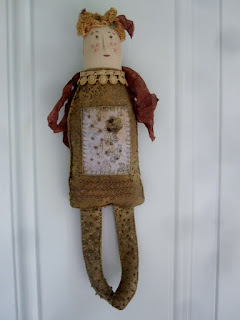 This was as a result of a giveaway connected to a blog hop for Sew Sweet Simplicity, a BOM that was designed by Jacqueline Steves. 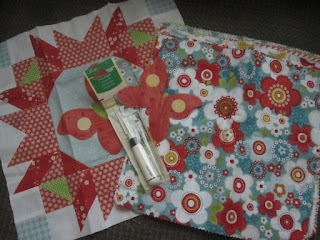 Since Jacqueline of Sew Sweet Simplicity hosted the blog hop, I also won her e-book. 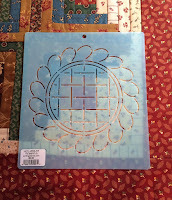 And, I also won some quilting stencils from Lori of Humble Quilts. Just last month I won these wonderful batiks and this pattern from Marlene of KISSed Quilts. This is Joy. She is the creation of Penny, of Art Journey, who was giving away one of her "Whisper" dolls every week in August and I was lucky enough to be one of the winners. Here she is on my front door. I thought maybe the background and lighting were better to show her off. Just click on any of the photos to get a closer look at the beading on her legs and torso. 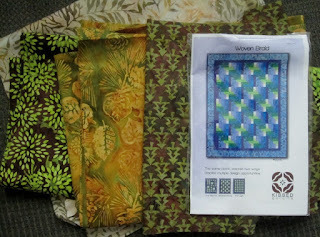 Just recently, I was also fortunate to win in a draw for a pattern of my choice from Dreamworthy Quilts. All I did was comment as a participant of the EQ Seasons Row A Long hosted by Marian of Seams to be Sew. They have some lovely, free patterns from various designers for you to make your own seasons row quilt. Forgive me if I have forgotten to thank you Ann of The History Anorak. She was giving away books to readers who commented and I received the book, The Boy in the Smoke by Maureen Johnson, which both my husband and myself read and enjoyed. This was quite a while ago - so my apologies to Ann for my tardiness. Life just sometimes gets in the way. All this just because on some blogs, all I did was leave a comment and Mr. Random Generator picked me. So, don't be afraid to comment - you just never know what's in store for you. And please check out the links to the various blogs which I have provided. You can find some very interesting things to see and read about. Those are all nice things to win. It's true that it doesn't take much effort to post a comment and then maybe win something you will like to receive. And getting such nice mail is a treat. Wow congratulations, Dolores!!! 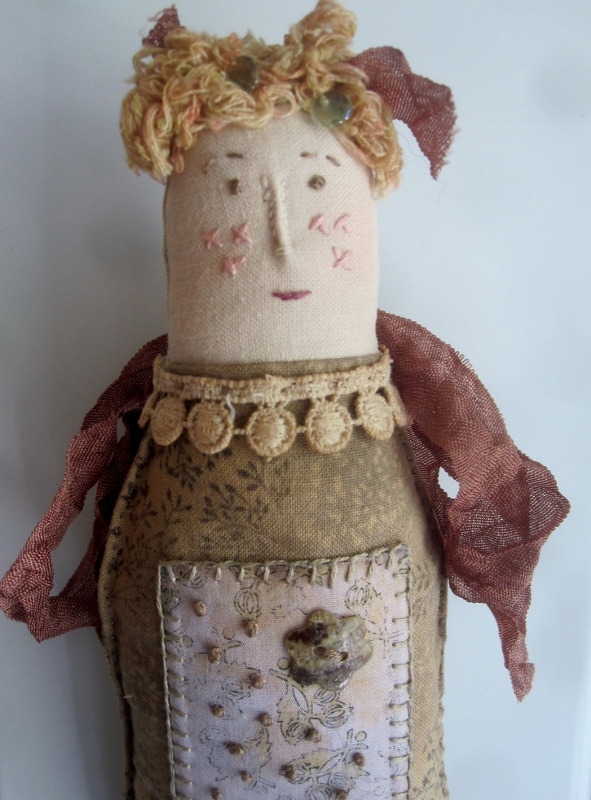 What lovely wins - especially that doll - she is amazing!!!!! Yes, lucky you for sure!! You won some amazing things. Deservedly too, I might add.